LYFT Blueberry Slim All White portions brings the taste of blueberries and a regular strength level of nicotine. From the makers of EPOK, instead of using white tobacco like EPOK, fiber from eucalyptus and pine is used. Aside from the nicotine extracted from tobacco, this is an all white tobacco-free product. Experience fresh, sweet and piquant blueberries. 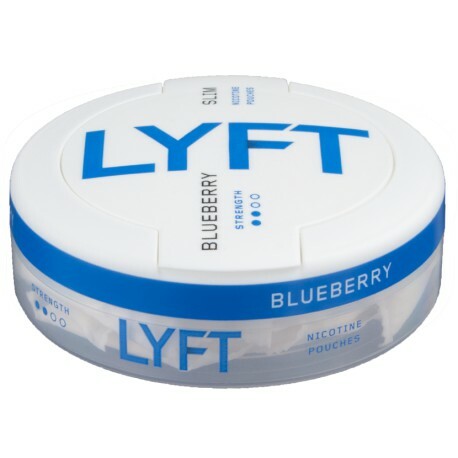 Feel how the rich blueberry taste lifts your mood to new heights with LYFT Blueberry Slim All White portion snus. I have a friend who owns a marijuana store in Colorado, USA. These LYFT flavor descriptions have a very similar style to his emails and texts...or to when someone at a party slipped me some LSD. Fear not! I, Moe Unz, did not experience any hallucinations when trying out LYFT so I think it is just hyperbole. And the Blueberry is very good too!